«Bill Russell, the reclusive Boston Celtics Hall of Famer, was visiting the White House last year when David Axelrod seized the chance to settle a personal score dating back to the mid-1960s. As a kid growing up in Manhattan, Axelrod shagged players’ autographs outside Madison Square Garden. Most visiting players obliged, but not Russell, one of the league’s first black superstars and an early Axelrod idol. So when Russell and his daughter sat down for lunch in the White House mess, Axelrod put on the squeeze in his genial but unyielding way – and Russell broke a lifelong no-autographs policy to scrawl his name on a White House souvenir basketball. That ball nested on a bookshelf in Axelrod’s West Wing office until he packed up the boxes on Friday after two tumultuous years as President Barack Obama’s message man and avuncular alter ego. It was a testament to Axelrod’s water-against-rock persistence — and a competitive fire that belies the caricature of Axelrod as a Woody Allen character in an administration of steelier David Mamet types. “David is as competitive and driven as the president and I am. He wants to win,” said former chief of staff Rahm Emanuel, a longtime friend who, like Axelrod, initially opposed Obama’s plan to push full-speed ahead with health care reform in 2009. But inside the White House, no adviser had more access to the president or lobbied more aggressively, or patiently, to have his opinions prevail. And Axelrod’s advice to Obama, regardless of the issue or his immediate prospects of winning, was always the same: Don’t forget who you were in 2008. While Obama has sometimes rejected Axelrod’s tactical advice, he’s increasingly turning back to that vision of an elevated politics as 2012 approaches. Thanks to Obama’s successful lame-duck session, the widely praised Tucson speech, whose drafting he oversaw, and presidential approval numbers that are clocking in at 50 percent for the first time in a year, Axelrod, who celebrates his 56th birthday next month, leaves on a professional high note. Those principles include transparency, bipartisan compromise and a rejection of Beltway cynicism – and Axelrod thinks Obama’s recent rebound is sustainable if he sticks to them. “We do have a greater opportunity in the next two years because of all the work we’ve done in the first two years. We have a clear field in front of us,” he told POLITICO between bites of salad in his West Wing office about a week before closing up shop. 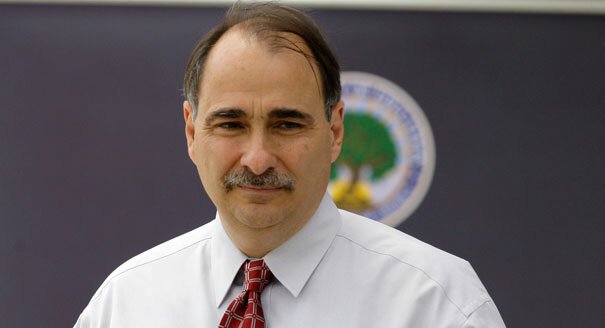 Yet as Obama’s fortunes improve, Axelrod’s own legacy is the subject of intense debate among some Democratic allies who say he failed to conceive and execute a coherent messaging strategy to sell Obama’s stimulus and health reform bills or deal with the economy, leaving Democrats dangerously exposed in the midterms. Even as the acrimony fades, there is a widespread feeling among the diminished ranks of Democrats on the Hill that Axelrod was the architect of a strategy that often portrayed them as part of corrupt, wicked “Washington” – and that Axelrod only scaled that back after an ugly confrontation with then-House Speaker Nancy Pelosi last year. “He was a lot better at covering Obama’s rear end then selling the country on Obama’s programs,” said one senior Democratic aide, who spoke on condition of anonymity for fear of offending Obama’s team. Axelrod, who still describes himself as an “outside the Beltway consultant” after two years of sitting several paces from the Oval Office, said his return to Chicago will be good for Obama, giving him some much-needed “above the trees” political perspective from Manny’s, the Jewish deli in Chicago that lets him run a tab. Over the next few weeks, he’ll rest, maybe take a vacation, spend a lot more time with his adult daughter, who lives in a Chicago group home to help deal with the effects of severe epilepsy. He might write a book, but only after the 2012 campaign. He’ll probably help out a few political friends, especially Emanuel, whose name was recently restored to the Chicago mayoral ballot. “We talk all the time,” said Emanuel. Obama will miss Axelrod, but the arrival of David Plouffe who is taking Axelrod’s office eases the transition and has comforted a staff rattled by a major personnel shake-up. Still, it’s hard to imagine Obama having a more relaxed relationship with Plouffe than he had with Axelrod. On his last day on Friday, Axelrod gave two emotional farewell speeches, the first at a small 7:30 a.m. daily huddle with senior advisers in the office of new chief of staff Bill Daley. The second, a more emotional send-off, took place amid hugs and tears at the larger 8:30 a.m. staff meeting in the Roosevelt Room. That night the Axelrods and Obamas had a private dinner in the president’s residence. But Axelrod is keeping his apartment near Logan Circle (“He will be back here on a regular basis,” a senior administration official said) Gone, however, are his invitation-only Wednesday night strategy meetings there with Benenson, other consultants and White House hands, including deputy senior adviser Stephanie Cutter and Dan Pfeiffer, Obama’s communications director. “His legacy is that he helped elect President Obama and that he ensured, at every step of the way in the White House, that the president stayed true to what he talked about, that he hewed as close as he could to the central themes” of the 2008 presidential campaign, Emanuel said. West Wing colleagues describe Axelrod as a kind of in-house political carbon monoxide detector, a highly sensitive alarm that protects Obama from the toxic atmosphere of Beltway politics. The problem, they admit, is that alarm was often disabled to accommodate the realities of the financial crisis and Obama’s own ambitious legislative agenda. For the first 18 months of Obama’s term, Axelrod’s political advice was often brushed aside in the name of legislative sausage-making, much to his frustration, according to people who talked with him at the time. The first blow came soon after Obama took office, when a liaison to the Hill proudly trumpeted the fact he’d slashed the number of earmarks in a spending bill; Axelrod suggested banning all of the earmarks, but was quickly overridden. A short time later, Axelrod counseled Obama to crack down on bonuses given to executives at TARP-recipient banks. This time Treasury Secretary Tim Geithner won the argument – resulting in a political disaster when it was revealed that aid recipient AIG was doling out millions in bonuses. Health care was a more complicated issue for Axelrod. On the one hand, he knew the issue could be politically perilous for Obama. But own his bitter personal experience trying to force an HMO to pay for his infant daughter’s epilepsy treatment in the late 1980s drew him deeply into the fray. Other administration officials, including Emanuel and his deputy Jim Messina, took their lumps from congressional Democrats trying to close the health care deal, but Axelrod was the most effective surrogate on the Hill. He was good at soothing frayed nerves and also had a capacity, perhaps inherited from his father, a therapist who committed suicide when he was teenager, to patiently endure criticism, even abuse. That included a memorable Feb. 2010 tirade from Sen. Al Franken (D-Minn.) who laced into Axelrod for what he viewed as the administration’s messy messaging on health care. A more serious confrontation took place in late 2009 when Pelosi, then-Democratic Congressional Campaign Committee Chairman Chris Van Hollen and Majority Whip Jim Clyburn held a secret meeting with Axelrod to call him out for Obama statements they believed portrayed Hill Democrats as villains. Axelrod, according to a person who attended, politely countered by suggesting they embrace earmarks reform and lobbying disclosures. The House leaders demurred, but the two sides struck a compromise: Benenson would join forces with the DCCC’s pollster to focus-group unified messaging strategies. Relations warmed for a while, but by the spring of 2010, after the reform package finally passed, Pelosi and Co. began picking up renewed signs that Obama was again campaigning against “Washington” – and summoned Axelrod to the speaker’s office. When one of the participants griped “You can’t criticize Washington – we are Washington!” Axelrod guffawed, then calmly reminded his hosts that this wasn’t the best selling point in the midst of a tea party uprising. For anyone other than Obama, this was standard presidential politicking. But Axelrod – a Pelosi admirer who defended her during internal White House meetings — had always positioned his boss on a higher plane. And he couldn’t wait for it all to end, fretting to friends that the midterms were putting too much “torque” on Obama’s core image as a positive force. He soon had his chance to reclaim lost ground with moderates and independents. Late last year, when wounded liberals demanded Obama block renewal of all tax cuts rather than accept a temporary extension of those for the wealthy, it was Axelrod who spoke up most forcefully in favor of compromise with Republicans, arguing that that the extension of middle-class tax breaks and unemployment insurance was well worth the trade-off. Axelrod now returns to Chicago to help set up the reelection campaign and freshen the Obama brand. The still-evolving message, unveiled in the State of the Union, seems to be “Green Tea,” a fusion of Obama’s vision of green jobs-fueled recovery and his new focus on the deficit, a distinct Tea Party flavor. In Axelrod’s view, the sluggish but steadying recovery gives Obama “the luxury” of focusing not only on jobs but a larger, more optimistic and confident message of American revival, in the vein of John F. Kennedy and Ronald Reagan. From a personal perspective, Axelrod’s most satisfying victory may have come during last week’s State of the Union, when Obama announced he would automatically veto any spending bill that contained earmarks. Like many of Axelrod’s victories it was a defeat avenged: Even as Obama publicly ridiculed John McCain during the 2008 debates over McCain’s obsession with earmark reform, Axelrod privately pressured Obama to embrace the effort.